Based in Woodbridge, Ontario is our Window, Patio Door and Aluminum Storm Door supplier. They have been supplying those products exclusively since 1987. VWD recognized quickly that there would be a significant benefit in manufacturing custom sized windows if all their equipment was computer driven. When the order is entered in the main computer, the component list is automatically distributed to the cutting machines at production stages for the frame, sash, spacer and glass. This system virtually eliminates all human errors, reduces waste and increases efficiency those giving maximum product value. All products have been tested and approved to the CSA A440-M98 Window Standard. Windows are tested for air and water penetration as well as undergoing structural testing for wind load deflection. All windows meet strict standards for resistance to forced entry. Multiple tests are performed to create increasingly adverse conditions in order to determine the performance limits of the window. As part of their vision for growth with quality control, every effort has been made to bring the extrusion process “in house”. The Windows Design Group includes its own PVC extrusion facility capable of making the most detailed shapes with resin from PolyOne. Our PolyOne is a superior PVC, With costly additives such as Titanium Dioxide. It is designed for long-term durability as a premium building product. This formulation is completely lead-free to protect homeowners from health hazards. Their virtually in-house process has allowed VWD to offer a variety of colour options and to provide excellent service and delivery of products that many manufacturers cannot afford to keep in stock. Wall thickness of every VWD extrusion exceeds the standard set by The Vinyl Institute, A Division of The Society of the Plastics Industry Inc. This label certifies that their products meet the operational and optional thermal performance required by the CSA and are subject to independent inspection to verify manufacturer¹s claims of performance and energy efficiency. Many of their products are Canadian Standards Association and National Fenestration Ratings Council Certified. When a company tests a window, they often send a specially made unit to achieve the best result. This means that the windows they sell are very unlikely to live up to the performance claims they publish. A certified window means that testing is performed on a production window that is chosen at random by an independent tester. You are assured that the test results are an accurate reflection of the window you purchase and the materials used are the same as those in the test window! VWD is proud to be 2006 Energystar manufacturer of the year. 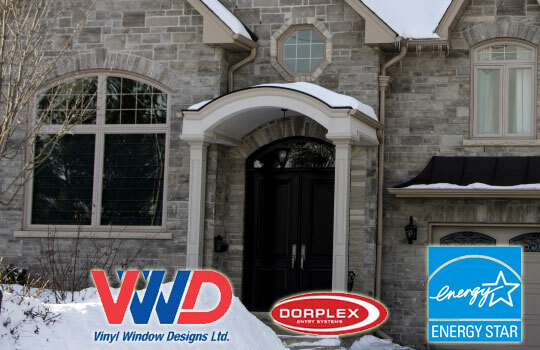 Dorplex Entry Systems is based in Toronto Ontario established in 1987.They also offer you the best warranties in the industry. With their Lifetime Warranty you can rest assured that you are choosing a door system built to look great and work hard for years to come. At Dorplex, they understand that the entrance door can dramatically enhance the overall image of your home. A high quality, custom designed door will distinguish your unique home from others in the neighbourhood. With an ultimate homeowner in mind, they are continually creating new and innovative products that combine durability and performance with custom design and value, and will make every home more beautiful and more valuable. Their products have been tested to the most stringent specifications and are unparalleled in strength and security. They feature a Lifetime Warranty to provide the timeless beauty and elegance with none of the worry maintenance to your entryways. Effective January 1, 2010. Dorplex Steel and Fiberglass Lifetime Warranty is Fully Transferable and Non-Prorated. Dorplex warrants that each door that they manufacture is free of manufacturing and/or material defect for the lifetime of the product under normal use and service, subject to the limitations and conditions herein. Grained fiberglass door panels will not dent, rot, or buckle for a period of 20 years from the date of purchase. Durham Windows and Doors is an expert when it comes to Door and Window Installation in the Durham region and the surrounding areas. Our high quality product is backed with a manufacturer’s warranty that is best in the business.